Tom Sawyer may have been ingenious converting whitewashing fences into play, but when he is trying to help Huckleberry Finn free a slave he represents the establishment. For those that don’t know the story, here is a quick overview: Huck and Jim are running away. Huck from his father, Jim from slavery. 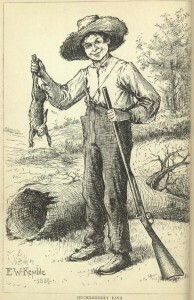 Eventually Jim is caught far from home and while his captors search for his owner, Huck happens to run into Tom Sawyer and the two of them set about freeing Jim. Jim is barely watched and very loosely locked up by a farmer. Freeing him was simple, but Tom doesn’t think that’s the right way to do things. After all, the daring escapes found in books came after many long years of planning and toil. The boys go through all manner of difficulty to make the escape as difficult as possible. For example, after digging a hole under the building which Jim could easily escape out of, they bake him pies with wax to deliver teaspoons to him. Jim needs a stone to carve some messages on, so they have him leave his captivity to help them carry the stone back into his cell. Instead of simply lifting the bed to release Jim’s shackles, they cut the leg off the bed and eat the saw dust (much to the disgust of all three). Throughout this time, both Huck and Jim question Tom about why in the world they should do all of this. Tom tells them they don’t know nuthin’. Who ever heard of someone escaping by just lifting the bed? That just ain’t the way it’s supposed to be done. Tom is stuck trying to reenact stories as the model for the way things are supposed to be done. He dismisses any ideas to the contrary. It’s almost painful to read as the answer is so obvious and yet Tom continues to take the most difficult path. But we all do this from time-to-time. We’ve read the books. We’ve heard the stories of other successful companies. Rather than creating our own path, we want to stick to what we’ve heard, what we think is safe. In a world that is changing so quickly around us, what we’ve done before or what we’ve heard may no longer be “the right way”. We can also be like Huck; we see the simpler solution but give in when the establishment pushes back. In fact, if we’re trying to do anything new, we’re likely to hear people tell us that it’s just not the way it’s done. But this is how new stories get written and how we can find success instead of failure. Sometimes it’s time to kill the sacred cows.